Application Server Load Balancing is a good thing regardless of if you are in a large environment or in a small environment in that it provides another layer of stability since the PeopleSoft Application Server has a nasty habit of acting up (especially on Windows). So, if you have two Application Servers setup in a Load Balancing (round robin) configuration, you will ensure that if one of your services goes crazy, you will have a backup running. Are Queue's synonymous with Handlers? This blog entry is not about load balancing requests from the web server across different application server domains. That is a different topic. I am discussing what happens as a single application server domain it is scaled up. I am not a fan of having multiple Application Server domains for the same database on the same physical server (there are a few specific exceptions). It doesn't provide any additional tolerance to failure. You can have one domain overload and while another has spare capacity because the load balancing of application servers by the PeopleSoft servlet does not usually balance well. The Jolt Listener (JSL) spawns a number of handler (JSH) processes. Each JSH has a return queue that is not exposed by the printqueue command in tmadmin, but can be seen with the ipcs command (a windows version is delivered as a part of Tuxedo). This article is about the inbound queues to the Application Server processes that handle service requests. Thanks. It would be cool if you could go into further details about this and how to go about tweaking it a bit more. Thank you for your excellent articles! Can you explain, please, how can we implement these steps? Chapter 13 of PeopleSoft for the Oracle DBA deals with configuring multiple queues, load balancing, calculating service loads, and setting service priorities. If you don't have the book take a look at the Advanced Tuxedo document on the www.go-faster.co.uk website. That is based on PeopleTools 7.5x, but the Tuxedo aspects have not changed. Thanks for the article and the excellent information in your books. I was wondering what equipment you run the test on especially how many CPUs on the application server? These domains with up to 14 PSAPPSRVs were running on virtual servers with 8 CPU cores. We need to stop crediting the Application Server layer with the ability to "load balance".... it uses a round robbin connection pattern which a) takes no notice whatsoever of any useful definition of the word "load" and b) ignores any attempt to "balance" said load. Come on JOLT engineers in Pleasanton - "load balancing" please in 8.52? Let's talk... there are several highly qualified Tuxedo and App Domain specialists out here with some very real requirements and useful ideas. Having said that I love the App Server architecture ... it's bomb proof, stable, reliable and still highly configureable even if it doesn't have "load balancing". 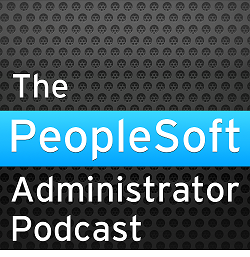 Thanks for a great write up here Dave and all the support you give to the PeopleSoft community. Thanks Graham, and you are quite right on all points. For the avoidance of any remaining doubt I have added a comment that this posting was discussing load balancing across queues within a Tuxedo domain, and not about load balancing across Tuxedo domains in the web server. Thanks David for all your comments and helpful information. Can you please provide me the syntax to run tuxmon script in AIX box . I am new to shell script and would like to use your script in our environment to find out the tuxedo processes.